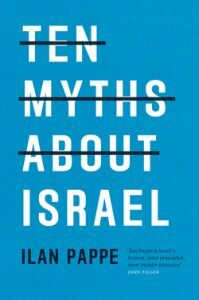 The English edition of Israeli historian Dr. Ilan Pappe’s 2016 book, Ten Myths About Israel, was released in May, 2017. Ilan Pappe, a self-hating Jew, lives in exile in Britain like Israeli author Gilad Atzmon. Ilan Pappe is also author of 2006 book, The Ethnic-cleansing of Palestine. Both books have been largely ignored by the Western mainstream media. In his latest book, which he published in German language, titled, What’s Wrong with Israel? The Ten Main Myths of Zionism, the author debunks ten founding myths created by the World Zionist Organization in order to establish an European colony in the Islamic Heartland – Palestine. I have exposed some of these myths in the past (here, here). The two greatest Zionist lies about Jewish occupation of Muslim-majority Palestine was that 1) the biblical God promised Palestine to Jews (here), and 2) there was no Jewish state to save them from the WWII Holocaust (here). The book, Ten Myths About Israel exposes other Zionist myths such as 1) Palestine Was An Empty Land, 2) The Jews Were a People Without a Land, 3) Zionism is Judaism, 4) Zionism Is Not Colonialism, 5) The Palestinians Voluntarily Left Their Homelands in 1948, 6)The June 1967 War Was a War of No Choice, 7) Israel is the Only Democracy in the Middle East, 8) The Oslo Accord of 1993 Was/Is a Genuine Peace Process, 9) The Palestinians Second Intifada of the 1980’s Began a Terrorist Movement Against Israel, and 10) The Victory of Hamas in the election of 2006 Began a Terrorist Movement Against Israel. Let us learn what non-Muslims say about the above lies …. Jewish communities existed in all over Europe, Middle East and Indian sub-continent where they controlled banking and media. Even they had an autonomous Jewish state inside Soviet Union, established by Stalin in 1934. However, both Torah and Talmud forbid true Jews to establish a Jewish state until the promised Messiah arrives. Tens of thousands of practicing and non-practicing Jews claim that Zionism has nothing to do with Jewish religion. On April 2, 2016, American Rabbi Brant Rosen in an article admitted that Israel is Settlers Zionist Colonialism. June 1967 war was a pre-planned Israeli war. The Zionist entity was never threatened by its Arab neighbors. In August 2012, during an interview American Jew author Marianne Williamson admitted that Israel is not a democracy by any standard. The 1993 Oslo Accord was another Western Trap to sideline Palestinian dream of recovering their stolen homeland. Both Intifada I and 2 have nothing to do terrorism. In fact both were lawful resistance against Zionist terrorism. Former US president Jimmy Carter who monitored the 2006 election participated by Hamas and Fatah, told CNN on February 2, 2006 that since Hamas was elected by Palestinians in West Bank, Gaza, and East Jerusalem to form the government in a free-democratic election – the international community should accept the verdict irrespective its opinion of Hamas. British Labour Party leader Jeremy Corby and several Jew writers claim that Hamas is not a terrorist organization. Arabs are the initial victims, white people will be next. Have the sheep woken up? In general Jewish organisations see sionism as a positive development of judaism, and marxism as a part of that “family”.